AMD is closing out the month of March with the introduction of a new line of 12-core Opteron 6000 series processors, previously code-named Magny-Cours. The processor architecture not only raises the bar for server CPU's, but doubles the number of cores in Intel's latest Xeon processors rolled out just a few weeks ago. Businesses looking to consolidate servers, or expand server capacity should take a serious look at what the new AMD processors have to offer. With 12-cores, the Opteron 6000 processors provide an opportunity to do significantly more processing with a single server, or consolidate a number of existing servers to a single physical machine. In an AMD press release for the new processors, Patrick Patla, vice president and general manager for AMD's Server and Embedded Divisions, declared "The AMD Opteron 6000 Series platform signals a new era of server value, significantly disrupts today's server economics and provides the performance-per-watt, value and consistency customers demand for their real-world data center workloads." The Magny-Cours processors use AMD's newer G34 processor socket, which delivers four channels of DDR3 memory. That means it delivers more than double the memory bandwidth of the legacy Socket F motherboards, and trumps Intel's triple-channel memory controller architecture. Another coup for AMD, aside from trumping Intel's Xeon processors, is signing on Acer--the number two computer manufacturer--to utilize the new processors in its server lineup. 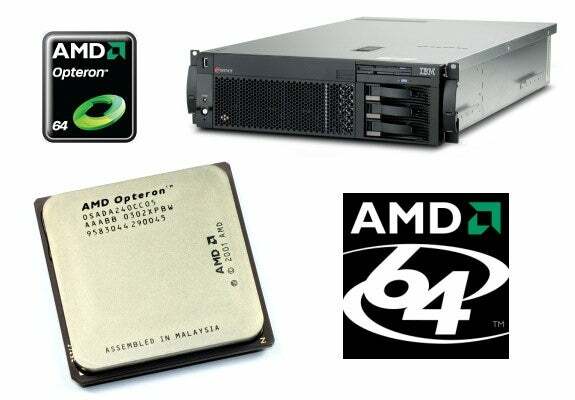 An AMD press release for the Acer partnership quotes Patla as saying "The new AMD Opteron 6000 Series platform, in combination with Acer Group's innovative server design, can give small, medium and enterprise businesses flexibility in an ever-changing IT environment." Patla summed up the new processors and relationship with Acer, "The AMD Opteron 6100 Series processor is the only server processor with up to 12 cores and four channels of DDR3 memory, providing the muscle to tackle larger, increasingly complex and multithreaded applications, while scaling memory and maintaining power efficiency and overall value for customers." The biggest benefit, though, for small and medium businesses may be the price tag rather than the processing horsepower. Intel's Xeon six-core Xeon processors cost nearly three times more than AMD's 12-core Opterons. Even if the AMD only matched the Xeon's six cores and provided no other benefits, the fact that the Opteron is a third of the price of the Xeon is reason enough for cost-conscious businesses to look at AMD. Gianluca Degliesposti, vice president of Global Server Business Development for Acer shared in the AMD press release "By taking advantage of the unique features of the new AMD Opteron 6000 Series platform, Acer Group SMB channel and HPC partners are well positioned to deliver extreme value with high performance, energy efficient servers to customers worldwide."